Genealogical documentation or proof is required for each generation from the veteran ancestor to the applicant. Forms will be provided for this purpose. All application papers are examined carefully by competent genealogists before approval for election to membership is granted. 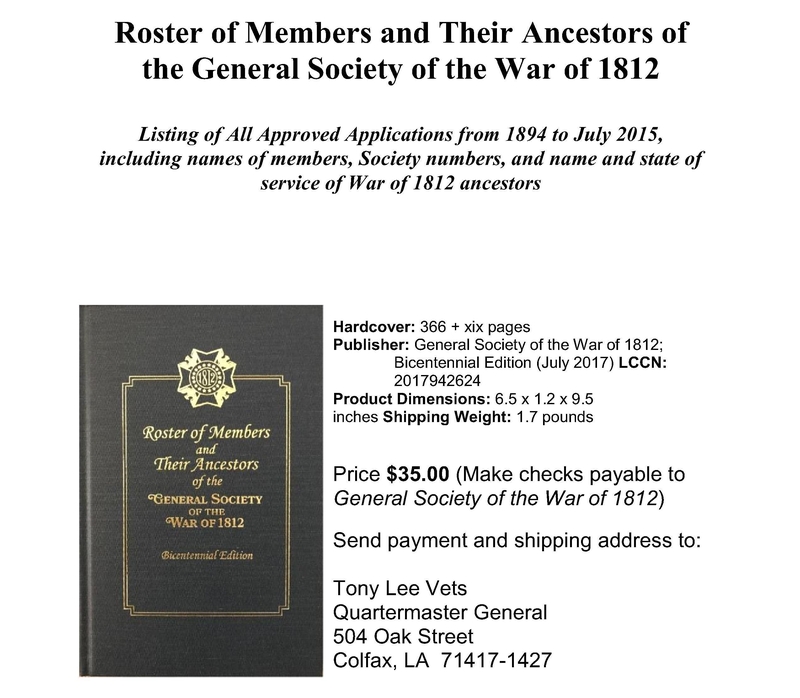 Any male person who is a lineal descendant of one who served during the War of 1812, in a military service of the United States, offering proof thereof satisfactory to the State Society to which he may make application for membership, and who is of good moral character and reputation, may become a member of this Society when approved of by said State Society, under such regulations as it may make for passing upon applications for membership. (5) Service as the President of the United States, Secretary of War or Secretary of the Navy between November 7, 1811 and July 18, 1815. (6) Service as a Governor or Adjutant General of a state or territory of the United States between November 7, 1811 and July 18, 1815. No service, however, shall be regarded as qualifying if the person who rendered such service voluntarily bore arms against the United States at any time between the dates named or if such person’s latest service between said dates was terminated by a separation from the service under conditions other than honorable. In case of the failure of lineal descendants of an actual participant in the War on behalf of the United States, one collateral descendant, who is deemed worthy, may be admitted to represent the said participant. Provided, always, that such representation shall be limited to the descendant of either a brother or sister of the participant in the war, in right of whose services application for membership is made.